Home / Uncategories / The Coffee Bean Tea and Leaf gives back at 50.. The Coffee Bean Tea and Leaf gives back at 50.. In celebration of their 50th anniversary, Coffee Bean Tea and Leaf is giving it back to their customers. They are offering 50% off on their featured beverage every Monday, from 3:00-5:00 PM for the whole month of May on all their branches. For this week, their featured beverage would be everyone's favorite, Caramel Ice Blended. 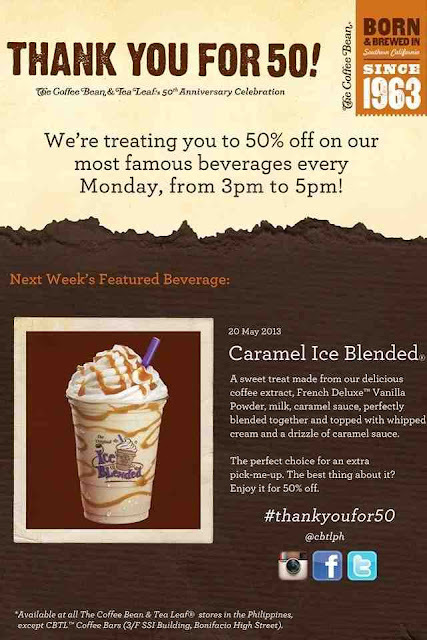 Don't forget to take a snapshot of your drink and use the hashtag #thankyoufor50 and tag @cbtlph. They are raffling some prices weekly.